Tell us your story… Zac is an actor and he was in a play my friend had tickets for. My friend knew the playwright, so after the show we all went out for food and drinks, which is when Zac sat next to me in our booth and asked how we liked the show. He helped himself to my french fries as we got to know each other. We’ve been together ever since. Where did you two tie the knot? Central Park. I wanted a place in NYC, since this is the city where we met and fell in love. I also wanted a location that I could always go back and visit, with our kids someday, and when we [grow] old. Central Park will (hopefully) always be there. Unlike restaurants and event centers in NYC which turnover all the time, Central Park felt right. It’s an iconic NYC location and a place Zac and I love to go to with our dog, Simon. Spill the details about your wedding! 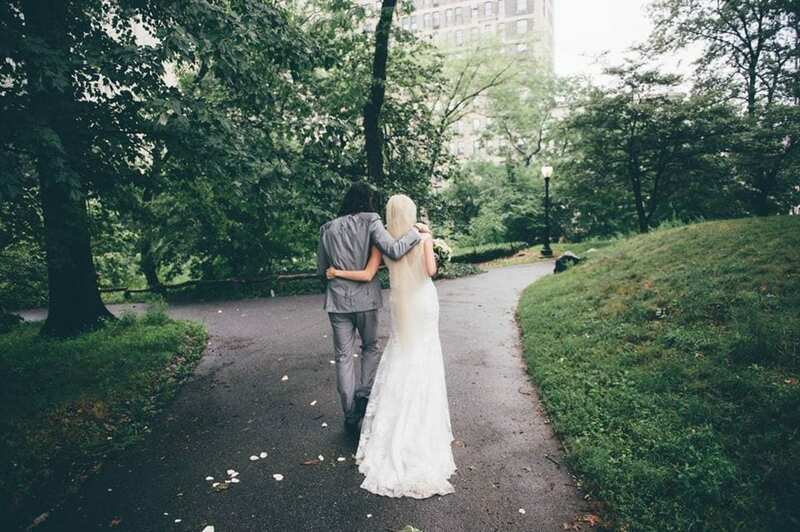 We wanted a pretty casual, yet elegant NYC wedding. Since [the ceremony] was outside in the park we played with that idea [by] using a food truck as our caterer and paper plates to give it that picnic in the park feel, even though our reception was in a dance studio downtown. I’ve always loved black and white, so those were our colors with a splash of gold. Our flowers were Dahlias since they are big, beautiful, and in season. *I purchased my [gold] veil from Alyson Nicole, [who] I met in college. I remember her talent shining though as a fashion student and I knew she would be the perfect fit to make my wedding look come to life. What was your favorite moment? One of my favorite memories was when a student of mine texted me in the morning. It was a complete surprise and reminded me how happy I am in my life, working a job that I love, marrying the man that I love, and surrounded by people that I love. I also loved my daddy/daughter dance, which we started slow and ended with a fun choreographed number to my fav, Taylor Swift. One of our friends surprised us with a limo at the end of the night which was fun surprise that we shared with our close friends and family.